…1st, locate and pull out drawer no. 1. Enjoy the treat and replace the drawer in the opposite direction to reveal part of the Nativity scene. Repeat each day and on Christmas Eve the scene will be complete! A fun and affordable way to enjoy Advent year after year! 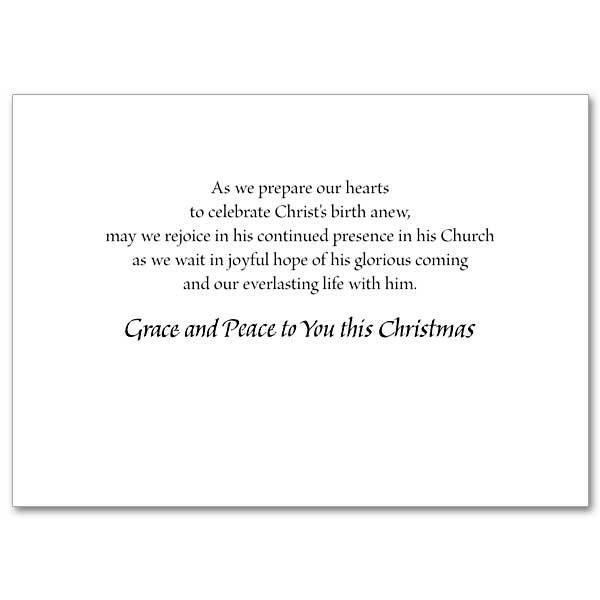 12" x 10.25" x 1.75"
Get a head start on your Christmas card list with a card that&apos;s appropriate for early Advent sending! Illustration of a chalice, host on paten, open missal, lighted candle and poinsettia on an altar. …with this fun-filled coloring book. On December 1st, begin by reading part of the Nativity story and coloring the associated pictures on the facing pages. Continue on each day of Advent and by Christmas Day, you will have a treasure from this special season to keep for years to come! 48 pages. Elegant simplicity of a polished brass finish marks this Advent ring, traditional table centerpiece for the days of awaiting the Lord&apos;s birth at Christmas. Can be used by itself or decorated with your own greenery. Ring is 11" diameter; four candles included (3 violet, 1 rose). …of Sisters located in rural Missouri, dedicated to prayer chant. Advent at Ephesus includes an amazing variety of traditional Latin and English hymns, polyphony, Gregorian Chant, medieval harmonies, and an original piece to prayerfully lead listeners through the sacred Advent season. 16 tracks. It is sometimes hard to find the right color candles in a local store. Here is an annual replacement set to fit your Advent Wreath in one convenient package. Five 10" candles, one white, one pink and three purple.